The drones are coming. Not as flying deliverymen that bring diapers, books or soup cans to your home, a vision put forth by Amazon CEO Jeff Bezos to much fanfare a little more than a year ago. For now, this all remains theoretical. Except for a few locations, U.S. airspace is closed to commercial drones. Regulators say the danger is too great, and they want to go slow easing unmanned aircraft into the already crowded skies. Advocates of the young drone industry complain that the long wait is keeping them grounded. Big-money investors are generally staying away, waiting for clear government guidelines. And the blanket flight prohibition has prevented companies from experimenting and advancing the technology. That includes developing sophisticated collision-avoidance systems or finding ways for the aircraft to navigate without human help. "Most of these drones have very limited safety features," says Maryanna Saenko, an analyst with science and technology consultancy Lux Research. If one crashes, "it's a four- or five-pound brick coming out of the sky." Most Americans associate drones with the military, which uses unmanned aircraft to survey battlefields and hunt terrorists. In a similar manner, businesses of all kinds envision using them to perform jobs that are too difficult or dangerous for humans, as well as tasks that can be done more cheaply and accurately by machines. If safety and regulatory obstacles can be overcome, within the next three years, drones and the companies that support them could generate $13.7 billion worth of economic activity in the U.S. and create 70,000 new jobs, according to the industry's trade group, the Association for Unmanned Vehicle Systems International. That's just domestically. In less than a decade, as many as 32,000 commercial drones could be flying worldwide, according to aerospace consultancy Teal Group. Only a third will be in the U.S.
Canada and a dozen European nations including Germany, Ireland, Sweden and the United Kingdom have already set rules allowing some drones but under strict conditions. Canada, for instance, allows flights only during daylight and good weather and requires the controller to keep the drone in sight. The Federal Aviation Administration plans to release guidelines soon about who can fly drones weighing less than 55 pounds and under what conditions. There might also be the extremely stringent — and costly — requirement that operators have a pilot's license. That means some of the most ambitious drone ideas, like Amazon's package-delivery system, will probably have to wait. First, drones will tackle the hard-to-do jobs, the dangerous industrial tasks, often in remote places. To see the potential of drones, go to a plateau in the Southern California desert covered with cacti and brush. There Teena Deering, a former Navy helicopter pilot who later taught drone warfare, is testing the idea of using unmanned aircraft to inspect power lines. A generation ago, military pilots would retire and fly for airlines. Today, they are working on drones. "It's just the way of the future," Deering says. With a few quick movements of a wireless controller — the type used for model airplanes — Deering sends a 1-pound drone racing into the sky around a 165-foot tower. Live video streams back from the drone's camera, showing her the condition of the lines. The 500,000 volts passing through them create a constant buzzing that can be heard from the ground. Normally, the remote lines are inspected by helicopter, a difficult job that costs $1,200 an hour. But San Diego Gas and Electric thinks that drones might be a cheaper, faster way. The utility maintains more than 25,000 miles of power lines and 185,000 utility towers and poles. In a region where winds surpass 100 mph, lines are often de-energized to prevent brush fires. Before power can be restored, the company needs to ensure there are no downed lines. That means sending out the helicopters or requiring crews to hike through rocky, uneven terrain filled with rattlesnakes and coyotes. Drones are already being used in Kuwait and Saudi Arabia to monitor remote oil pipelines. One drone could replace teams of inspectors. Perhaps the biggest industry ripe for drone use is farming. With the help of GPS mapping, drones can survey an entire farm, find bugs or soil that is too dry or too low in nutrients and then send the exact coordinates back to a tractor that will apply pesticide, water or fertilizer only to areas in need. Taking it a step further, there are 2,500 unmanned miniature helicopters currently used by farmers in Japan to spray pesticides in hilly areas where tractors might roll over. Similar drones are operating in South Korean and Australia. In the U.S., the $150,000 helicopters are being considered for the steep slopes of California vineyards. Farmers aren't expected to buy the costly drones themselves or learn how to fly them. Instead, imagine a modern-day door-to-door salesman who would offer drone services from farm to farm. Drones can also be used to improve crop yields and fight off disease. 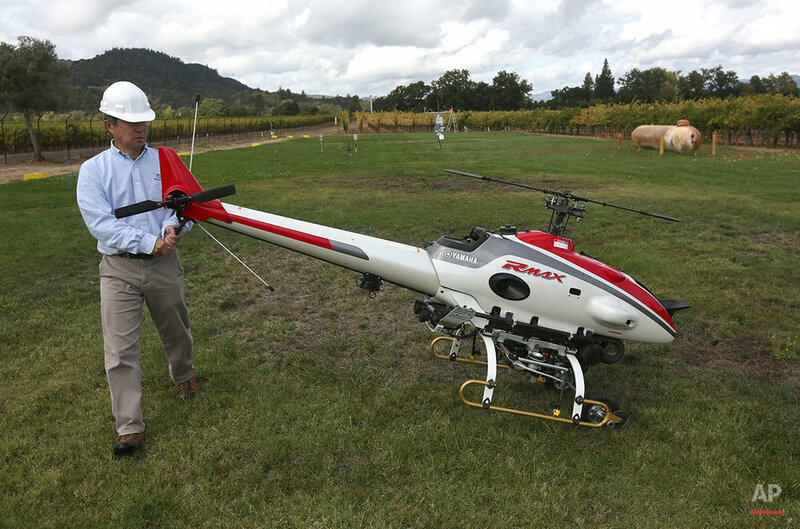 Some California wineries want to use unmanned aircraft to see which rows of grapes ripen first. In Florida, researchers are using infrared cameras to monitor orange trees for the deadly citrus greening disease. Drones could also be used to monitor the air for microbes that spread disease from one farm to other. Part of the initial appeal of drones is that they can go places that aren't easily accessible or safe for humans — collapsed buildings after an earthquake, nuclear power plants following an accident and neighborhoods damaged by wildfires, hurricanes or flooding. Oil refineries could use drones to inspect and troubleshoot their flare stacks, tall towers used to burn off gas. The flares give off so much heat that people often can't stand on the ground below, let alone climb the tower, unless there is a lengthy and costly shutdown of the refinery. For wildlife biologists who track migrating herds, the biggest job risk isn't snakebites or bear attacks. Two thirds of wildlife biologists killed on the job from 1937 to 2000 died in aviation accidents, according to a study by the Wildlife Society conservation group. The FAA estimates that 7,500 drones will be flying in the U.S. within five years. The industry puts the number in the hundreds of thousands. Compare that to the four largest U.S. airlines, with their combined fleet of 4,728 planes. "The FAA is just scared to death," says David Bridges, a mechanical engineering professor testing drones at Texas A&M University in Corpus Christi. "U.S. airspace is one of the safest in the world. It's their job to keep it that way." FAA Administrator Michael Huerta says drone technology is promising but needs to be phased in responsibly. "We have a duty to protect people in the air and on the ground," Huerta says. Some of the greatest danger is close to airports, where hundreds of airline passengers could be at risk from errant drones. The FAA has reports of nearly 200 cases in the past 10 months where drones got too close for comfort to manned airplanes. 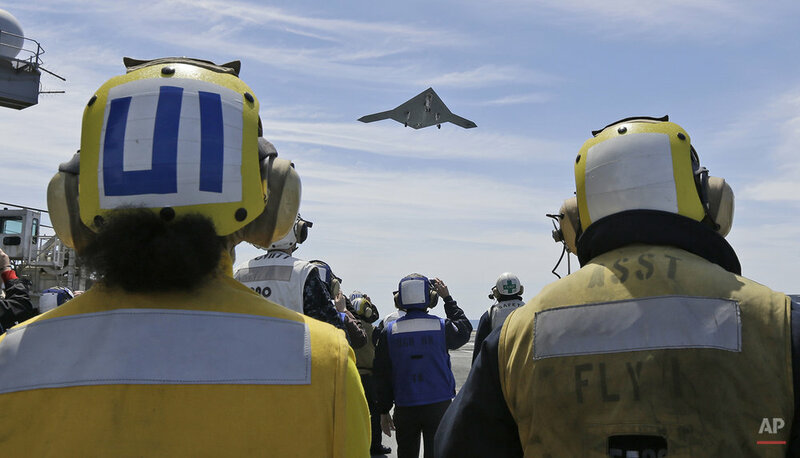 Even the military, with its expert pilots, crashes drones. The Air Force has lost 116 unmanned aircraft in the last decade and now has a rate of about five destroyed for every 100,000 hours of flying time. Others say if the FAA would just get out of the way and provide some basic rules, they could develop solutions to these problems. "We have very limited availability to test things," says Nicholas R. Alley, CEO of Georgia drone company AREA-I. "And that's the FAA's fault." While companies wait, more and more hobbyists are putting drones in the skies. Many of the devices are able to stabilize themselves and can be operated with an iPhone or Android smartphone. Some cost just $300. French company Parrot has sold 670,000 drones worldwide in just the past four years. The problem is that today's aircraft lack brains. They must either be controlled remotely by a pilot or fly a predetermined route from one coordinate to another. A wedding videographer in Wyoming lost control of his drone in 2013, hitting the groom in the face. More than 2.1 million people have viewed the video on YouTube. Technology that senses obstacles — buildings, power lines, trees or other planes — and avoids them isn't proven. Battery life is limited. And questions remain about hackers or terrorists intercepting and controlling drones. That's why Bridges and his Texas A&M colleagues fly drones from a lonely runway near the Gulf of Mexico. The nearest highway is 30 miles away. The surrounding county has 38 residents per square mile. And even there, if the drone loses contact with controllers for too long, it is programed to crash into the ground. Now, imagine drones flying around New York City, where almost 70,000 people live in each square mile of Manhattan. While a handful of big-name investors have poured money into drones, most of the money fueling the industry is coming from entrepreneurs' own bank accounts. Generally, venture capital firms prefer investing in industries with low infrastructure costs, such as developing smartphone apps or security software. They want a quick return on their money, and that's not something the drone industry can offer, at least not yet. Since the start of 2013, venture capital firms have invested more than $95 million in drones and related industries, according to data from PwC and the National Venture Capital Association. That might sound like a lot, but consider this: venture capital firms poured $63 billion into various projects across all industries during that time. For every dollar invested in drones, venture capital firms invested another $91 in biotechnology and another $263 in software. And those are just two sectors. Amazon says its drone delivery service could someday get packages to customers in 30 minutes or less. The company has assembled a team of aviation and robotics experts. They even have a former astronaut. Through its Prime Air service, Amazon aims to have drones flying 50 mph and capable of carrying up to 5 pounds, which covers 86 percent of products sold on Amazon. "They will become as normal as seeing delivery trucks driving down the street," says Paul Misner, Amazon's global vice president of public policy. Not everybody is so optimistic — including other shippers. Drones, they say, aren't a cost-effective replacement for existing systems and would struggle to navigate in crowded cities or around suburban trees and power lines. German delivery company Deutsche Post DHL is already testing a drone, but only to a remote tourist island in the North Sea and just for urgent deliveries of medicine. The only other option is a once-daily ferry that needs to wait for high tide. Drones aren't intended to supersede planes and trucks, says spokeswoman Anita Gupta. "It doesn't replace the solid network we have developed for our ground transportation," Gupta says. "This is not like some sci-fi movie."